Wood-frame wood structural panel shear walls are prevalent in high seismic areas where lateral forces from seismic loading control the required length of shear walls. Relatively large design strengths and permitted use of up to 3.5:1 aspect ratio wood structural panel shear walls provide design flexibility to accommodate building configurations where total length of wall or aspect ratio of wall portions available for seismic force resistance is limited. Additionally, wood-frame wood structural panel shear walls are permitted for use in all SDCs and, in SDC D, E and F, are permitted with structural height of 65 ft. In contrast, wood-frame shear walls sheathed with other materials are generally associated with smaller values of design strength, most commonly used where large lengths of shear wall are available, not permitted in SDC E and F, and limited to a structural height of 35 ft in SDC D. In some cases, such as for structural fiberboard shear walls and particleboard shear walls, use of such shear walls for seismic force resistance is limited to SDC A, B and C only with a structural height of 35 ft in SDC C.
Although special design criteria for anchorage of concrete or masonry structural walls to wood diaphragms have been in place for decades, some designers are unaware of these requirements. In fact, they exist both in ASCE 7 and building codes, having been developed to address instances where tall, single-story concrete and masonry structural walls became detached from supporting roofs, resulting in collapse of walls and supported bays of framing. The intent is to prevent the diaphragm from tearing apart during strong shaking by requiring transfer of wall anchorage forces across the complete depth of the diaphragm. 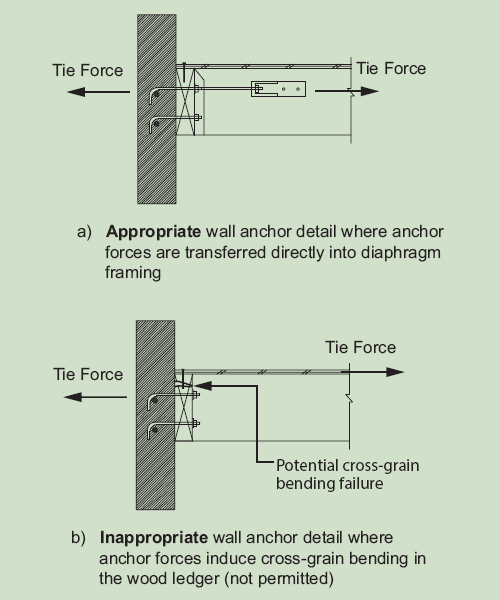 Details commonly employed for transfer of wall anchorage forces into the diaphragm use mechanical attachment between the wall anchor and wood framing oriented perpendicular to the wall (Figure C4.1.5B), avoiding direct loading of wood framing in cross grain bending. Special detailing provisions for wood diaphragms consistent with those in ASCE 7 have been added to 2015 SDPWS in Section 4.1.5.